Pollen is packed with bioactive substances, nutrients and active components directly from nature that may help herbivorous reptiles in various ways: Pollen has a beneficial effect on the immune system and the blood count, promotes vitality and well-being because it can boost many metabolic processes. Mixed pollen is diverse in its composition. It naturally contains, e.g. short-chain proteins, up to 20 amino acids, polyunsaturated fatty acids, minerals and trace elements such as iron, copper, manganese, zinc and silicic acid (silica), in addition to phosphorus, potassium, magnesium, sulphur and calcium. It also contains vitamin C, vitamin B1, 2, 6 and 12, as well as biotin, vitamins A, D, E, folic acid, niacin, pantothenic acid, antioxidant polyphenols such as flavonoids, natural sugars, enzymes, plant hormones and many other beneficial substances. 0.7 g (1 level measuring spoon) per 500 g body weight Mix NEKTON Pollen-Energy into the feed or offer separately in a bowl. In case of illness, the amount can be doubled, it cannot be overdosed. 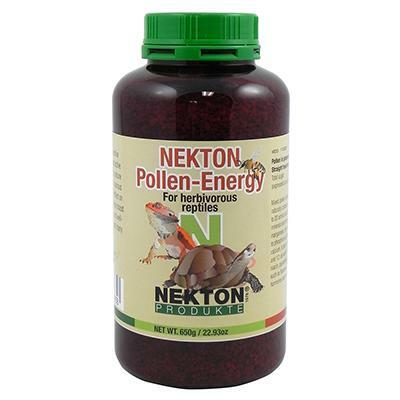 Storage: NEKTON-Pollen-Power should be stored dry and out of sunlight, between 15° and 25°C. DO NOT STORE IN THE FRIDGE!!! Recommendation: Clean drinking vessels and food containers daily with NEKTON-Desi-Natural to guarantee hygienic and clean feed!